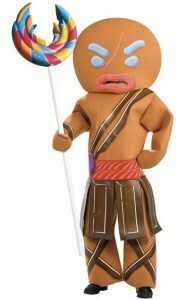 From Linens ‘n Things comes the Gingerbread Warrior is part of a band of warriors lead by the ogre Fiona. The Men’s Shrek Gingerbread Warrior Costume features a jumpsuit with printed warrior details including a twizzler belt with a gumdrop medallion, chocolate panels, and chocolate royal icing details. The headpiece has the Gingerbread Man making a mean face. There is a hole in the Gingerbread Man’s mouth that you can see out of. Make the Men’s Shrek Gingerbread Warrior Costume your Halloween costume this year. It’s also a great costume to wear as part of a group with all of your friends dressing as other Shrek characters. The lollipop weapon too.